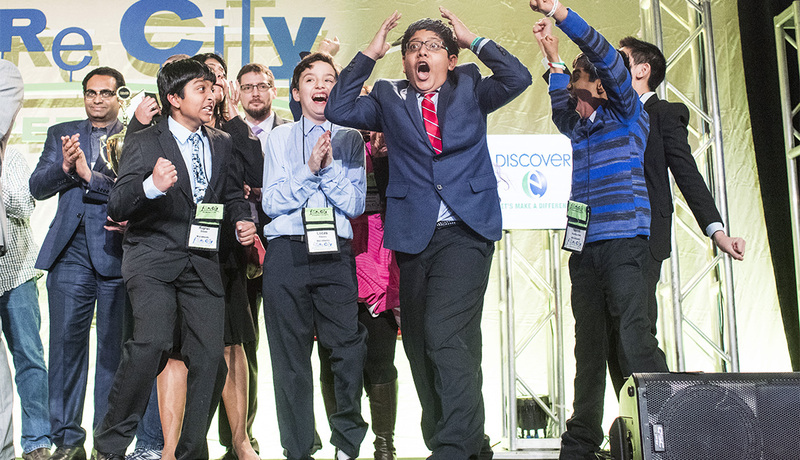 Team members from the Edlin School in Reston, Virginia, react after their team's city "Halona" won first place during the Future City Competition Finals at the Hyatt Regency Washington, D.C.
How do 13-year-olds envision the ideal city for aging in the future? It will include multigenerational housing, all kinds of autonomous vehicles and lots of cool technology to track health and help keep residents safe — such as robot caretakers, self-balancing shoes and a bionic suit that deploys airbags when the wearer falls. Those were some of the design suggestions offered at the 26th Future City Competition that was held in Washington, D.C. The annual contest — featuring a different focus each year — challenges middle school students from around the country to come up with a plan for improving the world. The 2018 contest asked the kids to envision an “age-friendly city” 100 years in the future. Some 40,000 students participated, with 600 students from 44 teams making it to this prestigious final round of competition. It’s a serious contest that would be daunting for many adults. 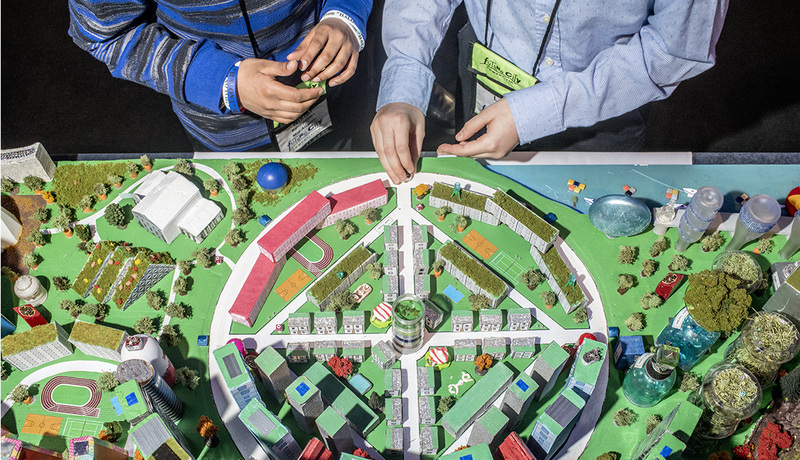 Kids are required to come up with innovative solutions to issues such as how their imagined city would get its food supply, offer efficient transportation and control waste — as well as find ways to keep the older residents happy and healthy. To qualify, they submitted a virtual city design using "SimCity," the city simulation online game; a 1,500-word essay explaining their plan; and a scale model of their city built with recycled materials. Many of the kids said they had spent 200 or more hours of work on their projects, with the oversight of mentors, over the past several months. Members of the Mid Atlantic team arrange their innovative city design at the Future City Competition Finals. Despite the hard work, the teams had fun. Vinay Ayala, 12, from the Reston, Va., team, one of the five finalists who presented their project onstage on Tuesday, described a feature in his team's elaborately planned future city that would convert wastewater into energy. “We call it pee-pee power,” said Ayala, with a mischievous smile. The Reston students ended up winning the grand prize — a trip to Space Camp in Alabama and $7,500 for their school’s STEM (science, technology, engineering and mathematics) program. Another team that made it to the final five, from Rochester, Mich., was aglow with nervous excitement after its members presented their future city, which they called Copper Valley. One of their unique space-age ideas included shoes that power cellphones when you walk ("to encourage exercise," they noted). Reagan Rutkowski, 13, said their months of research helped her see the flaws in her own city, especially the lack of public transit for seniors. “It’s expensive for them to get taxis,” she said, “and they probably want to spend their money on other things, like their family and grandchildren and stuff.” Rutkowski's team took home the $5,000 second prize.